The wait is now over! Today we are happy to announce Vembu BDR Essentials – an exclusive Backup and Disaster Recovery package for small businesses having backup requirements up to 6 CPU sockets or 50 VMs. With this new package, small businesses can cut up to 50% on their regular backup expenses. Backup is an IT essential. Your data needs to be safeguarded and nurtured for the growth of your business. The time to create a disaster recovery plan is not when you’re in the thick of it. If you think data loss could never affect you, think again. Data loss has the capacity to devastate any business, be it big or small. Recovering from data loss or any kind of disaster can take months or even years without having a proper backup solution in place. The situation turns out worse when considering small business firms. Investing in a backup solution once seemed extravagant, but now it is the best way to ensure that you can keep your business online. That’s why it is important to invest in a sound and reliable backup solution, to ensure that you can get back to business when you encounter data loss. Vembu began its journey in 2002 with an aim to meet the Backup and DR requirements of organizations across industries. This journey made us realize the fact that the primary problem faced by every small business is its financial constraints. 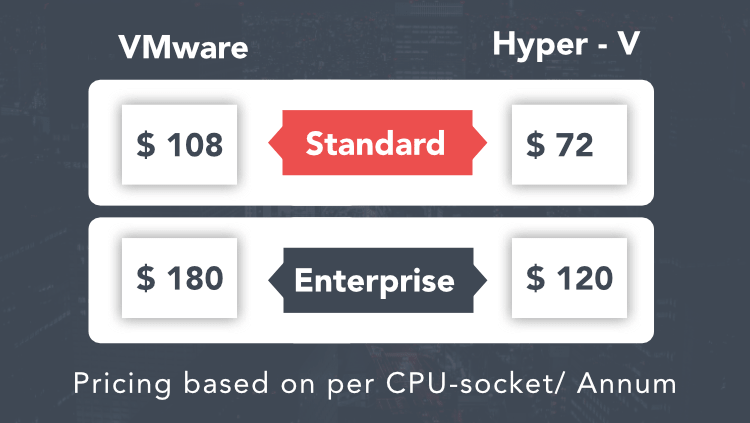 With the guidance of our customers and with a little insight of our own, we analyzed and understood the core backup requirements of businesses – scalability and price. And that is why we have come up with Vembu BDR Essentials, an essential package for small businesses looking for an affordable backup solution. You get to save up to 50% when compared to Vembu BDR Suite. 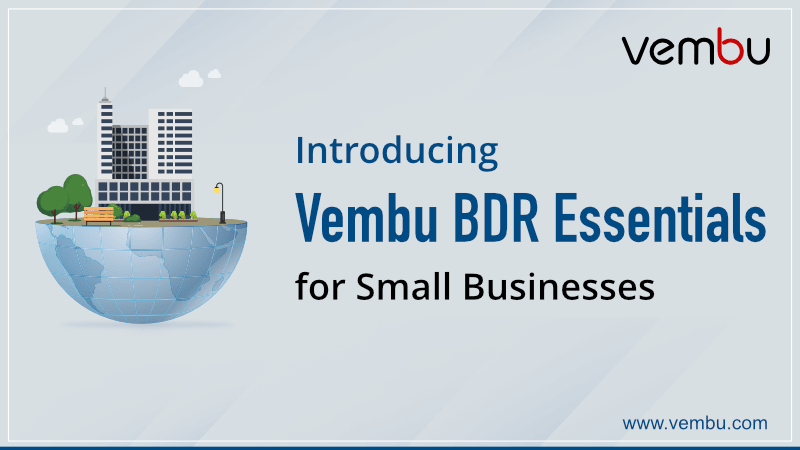 The main idea behind Vembu BDR Essentials is to help small businesses cut down on backup expenditure. With this, you can backup VMs running on VMware and Hyper-V, having up to 6 CPU sockets or 50 VMs. Licenses for Vembu BDR Essentials are provided at the host-level and VM-level depending on your business infrastructure. You can also opt for Enterprise or Standard edition based on your requirements. Now here comes the most awaited part, the pricing! This package offers you exactly what you want from a backup and DR solution at a very reasonable price. Check out for yourself! The frequency of backing up your data also determines how fast you can rise up when disaster strikes. With near Continuous Data Protection, you can backup your data every 15 minutes. This ensures that you have an RPO of less than 15 minutes. Recoverability is the crux of backup, and Quick VM Recovery ensures that you can get your business up and running in minutes. You can also test the recoverability through various options like Boot check, Mount check and Image Integrity check. With Vembu Universal Explorer, you can browse, view and granularly recover individual items of Microsoft applications like Exchange, SharePoint, SQL and Active Directory. This way, you don’t have to wait for the entire image to be restored. Your backup isn’t any good if it rests in your production premises, where a single disaster could cause damage to your production as well as backup servers. To ensure that doesn’t happen, you can replicate your VMs to an offsite location with Vembu OffsiteDR and Vembu CloudDR to be extra safe. Your business grows as time goes, and your infrastructure grows along with it. When there comes a time, where your backup requirements exceed 6 CPU sockets, check out our Vembu BDR Suite. While the BDR Essentials is custom-designed to protect your virtual environments, the BDR Suite is a comprehensive solution using which you can protect your entire IT environment. It has all the features necessary to take care of backup requirements for your environment – physical, virtual or the Cloud. Go questions? Email us at vembu-support@vembu.com for answer.